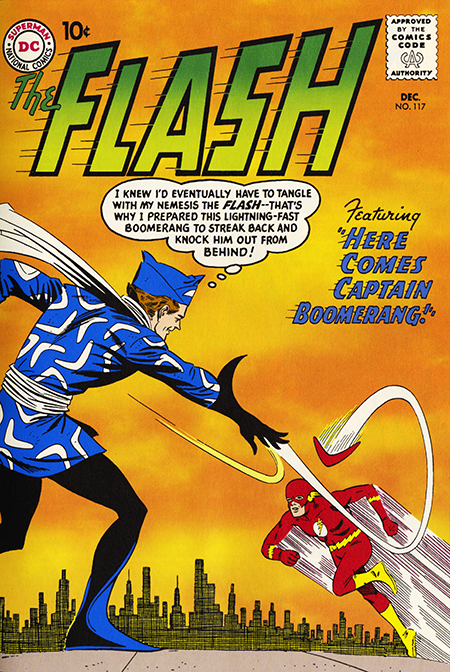 The splash page for “Here Comes Captain Boomerang!” shows the Flash tied to a giant boomerang and about to be catapulted into space by Captain Boomerang himself. I’m sure NASA would have loved to get their hands on that catapult since it defied even a twelve years old’s rudimentary knowledge of planetary escape velocities. Especially since it defied a twelve year old’s knowledge (twelve being the age when you know pretty much everything), but what made it all work so beautifully was another Broome backstory about a toy company magnet W.W. Wiggins’s search for someone to promote their new toy boomerangs and Digger Harkness the man they hire, along with the incredible artwork of Infantino and Anderson. The realism of the artwork alone was enough to make you suspend your disbelief and just let the story unfold. Captain B launches the Flash into space (I’ve already lost count… let’s just go with “yet again”) but the resourceful speedster saves himself as he falls back to Earth. The thing I remember about this this story was sitting down at our kitchen table with a pen and india ink that my dad had picked up for me and knocking off a dead-on copy of W.W. Wiggins, thus confirming my suspicions that this business was where my future lay. In the second story, Julie kept his word to letter hack Roy Thomas and featured the return of Winky, Blinky and Noddy. Nod-off was a bit more like it. This knock-off of the Three Stooges was pretty dated for my tastes and, as Julie would soon be told, most of the other readers as well. Julie had enlisted the help of their original creator Gardner Fox, and what was of far more interest was the letter from Fox that appeared in Flash Grams. In it he described how he had originated the original version of the Flash twelve years earlier (ancient history to me) and his bird brained (his words not mine) companions and provided my first glimpse of what went on in the Golden Age of comics. I was hungry hurting to know every detail so I wrote Fox a letter asking him to tell me more. He never wrote back. Now I’m sure Fox was inundated with similar requests and that responding to precocious twelve year olds was not a high priority, nevertheless, I promised myself that when my turn came, I would try to remember how that felt and do my best to not let any readers’s queries go unanswered. In a sad postscript, I saw in this morning’s New York Times that Murphy Anderson has passed away. Those who’ve been following these Flash Fridays already know of the deep respect I hold for his work. He was also the truest gentleman I ever met. Damn the New York Times.